FishyLeaks - the watery world's response to WikiLeaks - trawls the murky waters of the global salmon farming industry for leaked documents from whistleblowers and documents obtained via Freedom of Information. Scottish Salmon Infested With Parasites - Sea Lice Data Reveals 1001 Reasons to Boycott Farmed Salmon! Scottish salmon and sea trout are infested with sea lice parasites according to new data released by Marine Scotland via Freedom of Information and published online via FishyLeaks. Infestation levels of up to 145 sea lice per fish were recorded in Shieldaig in Wester Ross in 2012; up to 196 in Laxford in West Sutherland in 2008; 117 in Tarbert in Argyll in 2008; 113 in Sunart in Lochaber in 2008; and a staggering 1001 sea lice on a salmon sampled in Kanaird in Wester Ross in 2008. FishyLeaks reveals the illegal use of the carcinogenic chemical Formalin in a Special Area of Conservation in Scotland. Formalin is a highly toxic water-based solution of the known carcinogen Formaldehyde which is used as a preservative for biological specimens including artist Damien Hirst’s pickled sharks, cows and sheep. The Global Alliance Against Industrial Aquaculture (GAAIA) has now filed a complaint with the European Commission for breach of the Habitats Directive and illegal discharges of carcinogenic chemicals into a Special Area of Conservation (read complaint online line). FishyLeaks has been featured in the Los Angeles Times, The Guardian, The Press & Journal, The Stornoway Gazette, West Highland Free Press, The Sunday Herald and Undercurrent News. Scroll down below for damning documents including data exposing sea lice infestation in Ireland; toxic chemical use in Scotland and the spread of infectious diseases in Canada! Formalin is a highly toxic water-based solution of the known carcinogen Formaldehyde which is used as a preservative for biological specimens including artist Damien Hirst’s pickled sharks, cows and sheep. The FOI reply from the Scottish Government dated 23 November 2012 detailed 190 pages of documents – read in full online here from the Scottish Government (same file online here). GAAIA has filed further FOIs requesting data on Formalin use on Scottish salmon farms. 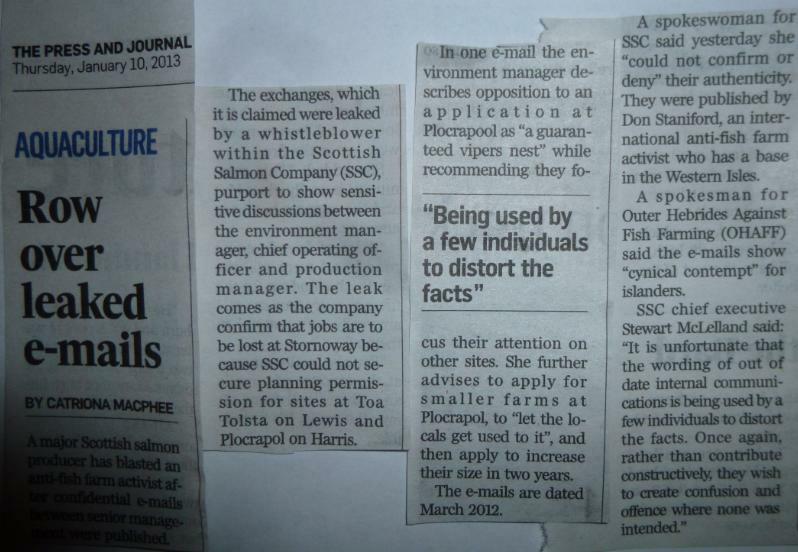 Earlier this month, FishyLeaks revealed leaked internal e-mails from a whistleblower inside the Scottish Salmon Company disparaging local communities on the Isle of Harris a “viper’s nest”. A leaked report reveals that the Scottish Government has been secretly "cleansing data" on Scottish salmon farms. The "data cleansing" project - called 'Scotland's Aquaculture Database' - is scheduled to go online at the end of July with publicity materials sent to schools across Scotland (read more via 'Scotland's Secrets'). However, thanks to the Global Alliance Against Industrial Aquaculture (GAAIA) who obtained the damning data via Freedom of Information, Fishyleaks can publish the raw and 'dirty data' online now! Details in full below and more background via 'Scotland's Secrets'! Diseases reported since 2008 include Infectious Salmon Anaemia, Infectious Pancreatic Necrosis, Haemorrhagic smolt syndrome, Amoebic Gill Disease, Ichthyobodo, Vibrio, Cardiomyopathy syndrome, Moritella vicosa, Yersinia ruckeri, Saprolegnia, Epitheliocystis, Salmonid alphavirus, Nephrocalcinosis, Tenacibaculum maritumum, Exophiala, Pasteurella skyensis, Renibacterium salmoninarum, Piscirickettsia salmonis, Capriniana, Proliferative kidney disease, Nocardia, Aeromonas hydrophila, Aeromonas salmonicida, Pseudomonas, Flavobacterium, Gyrodactylus derjavinoides and Gyrodactylus truttae (more details enclosed below). Lurking on Scottish salmon farms are some real-life horrors including Epitheliocystis which is associated with Chlamydia and Proliferative Gill Inflammation; and Yersinia ruckeri which is in the same family of pathogens as Yersinia pestis – the disease agent behind the Black Death or Bubonic Plague! Data on infectious diseases on Scottish salmon farms for the period 1980 to 1997 is also available online here. Data from 1998 to 2006 is online here. Company specific data is also available for 2006 and 2007. Exclusive data obtained via FOI from the Scottish Environment Protection Agency reveal for the extent of ‘morts’ (dead farmed salmon) on Scottish salmon farms. In 2011 there were 6.9 million morts – an increase on the 5.3 million morts reported during 2010. 2012 is shaping up to be even worse - already during the first three months of 2012 there have been 2.2 million morts! During the first three months of 2012 alone, Hjlaltland Seafarms (owned by the Norwegian multinational Grieg) racked up nearly half a million (475,512) mortalities (read data in full online here). Marine Harvest (also Norwegian-owned) was responsible for 340,631 'morts' (dead farmed salmon) in the same period (read data online here). The ‘mort mountain’ includes nearly 700,000 dead farmed salmon from just 11 sites operated by Northern Isles Salmon (Meridian/Morpol) in Orkney during March 2012. To put this into perspective, this is double the morts from Marine Harvest's 26 active sites (141,989) and Hjaltland's 22 active sites (207,804) combined during March 2012. The deaths include 194,905 at one site (Bay of Vady) with another 98,550 at the Bay of Cleat North site and 12,758 kg of morts from the Bay of Ham site. During 2011, the Scottish Salmon Company (another company registered on the Oslo Stock Exchange) had over one million mortalities (1,234,975 dead farmed salmon to be precise) including 267,114 at one site (St. Molios on the Isle of Arran) in October 2011 - read the data in full online here. Over a quarter of a million farmed salmon (265,113) died during May 2011 at Northern Isle Salmon’s Djuba Wick site in Shetland. Another mass mortality occurred in October 2010 when 197,277 farmed salmon died at Lakeland’s Point of Burkwell site in Shetland. In 2011, Lakeland and (Northern Isles Salmon) became part of Meridian (owned by the Polish company Morpol). This information was made available by the Scottish Environment Protection Agency via a CD of dozens of data files in May 2012 - please note SEPA's data re-use statement - online here. Data is also available for all other companies and for the years 2008-2010 (please email dstaniford@gaaia.org if you want the raw data as Excel spreadsheets). 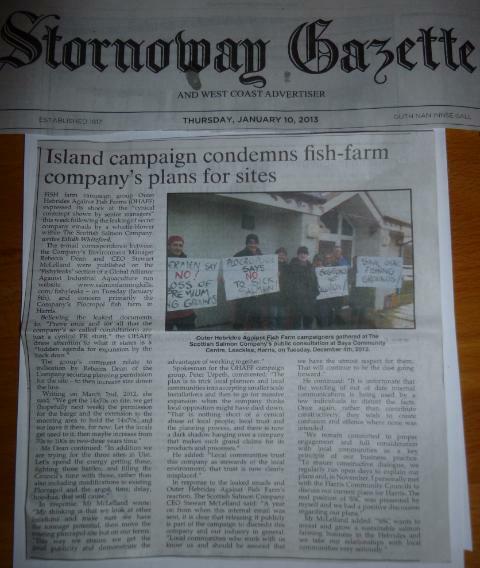 The use of toxic chemicals and deaths of farmed salmon is symptomatic of a disease-ridden industry. In fact, data obtained from the Scottish Government via FOI in May 2012 reveals alarming disease problems across Scotland.